Niobium minerals in zwitter and lithium–fluorine granite of the Verkhneurmiysky granitic massif in the Amur River region—fergusonite-(Y), euxenite-(Y), samarskite-(Yb), aeschynite, Nb-bearing wolframite— have been described and the similarity of their species composition established. The same-named and crystal-chemically allied minerals from zwitter and granite are characterized by similar complexes of such trace elements as W, REE, Mn, Fe, Pb, U, and Sc. A genetic link between Sn-bearing zwitter and Li–F granite is stated. Compositional varieties of niobium minerals in granite and zwitter reflect a change in the physicochemical conditions of mineral formation, when the magmatic stage is followed by a pneumatolytic–hydrothermal process. 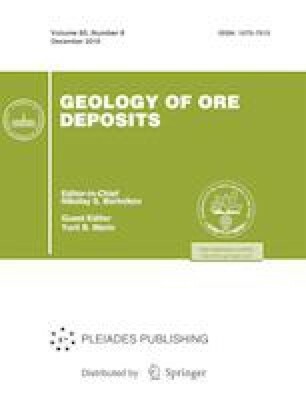 The postmagmatic evolution of niobium minerals is characterized by increased concentrations of Y, Pb, U, Fe and decreased concentrations of W, Ta, REE, Ti, Sc, and Th. The mineral occurrences in the western sector of the Verkhneurmiysky Cu–W–Sn cluster are appraised as promising for Nb, Y, and REE. Fergusonite, samarskite, euxenite, and Nb-bearing wolframite are indicators of rare metal mineralization. Original Russian Text © V.I. Alekseev, K.G. Sukhanova, Yu.B. Marin, 2018, published in Zapiski Rossiiskogo Mineralogicheskogo Obshchestva, 2018, No. 1, pp. 85–100.